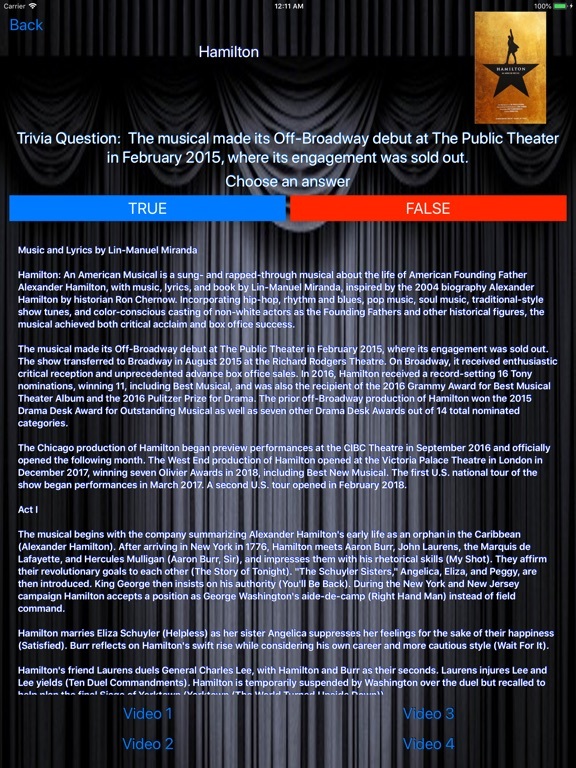 On Stage: Musicals features trivia questions, clips, songs and full recorded productions from over 1,400 musicals from all over the world (America, England, Canada, Germany, Japan, Holland and more). With over 650 hours of music and videos from productions all over the world, this app can help you discover shows you’ve never heard of or even possibly your new favourite! Choose a decade from the 1800s to today and try to answer each questions (one per musical); read about the storyline, production history or simply watch the videos to see and hear selections from the score. Video can be streamed on you iPhone, iPad or iPod touch through both Wi-Fi and devices that are 3G/4G network enabled. Only available on the App Store! 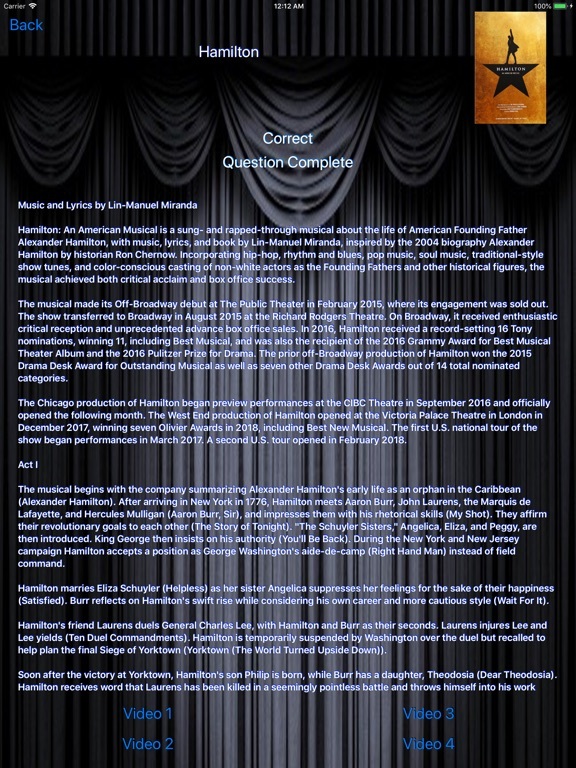 - Information on each show including the Composer, Lyricist, Production History and Synopsis of the story. So, that is the reason I built this app. I hope it will help you discover show’s that you wouldn’t have been able to yesterday. 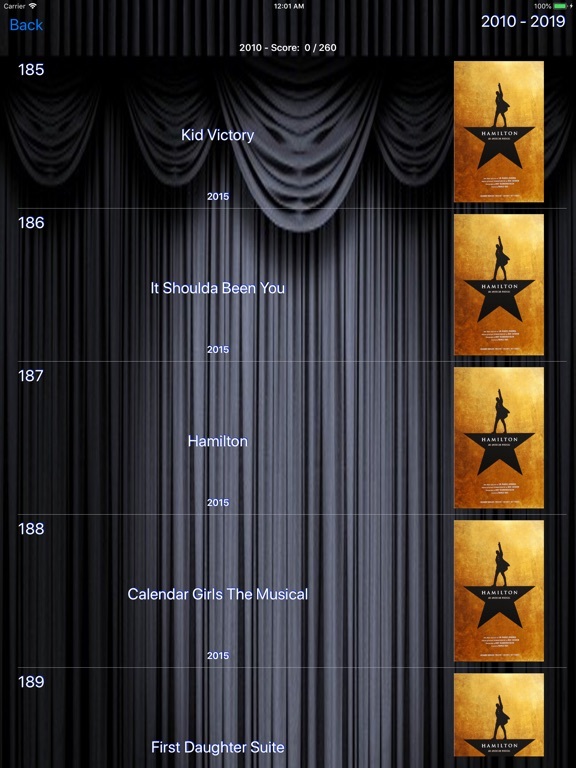 I’ve included as many musicals from around the world as I could (and will periodically update the app with new shows when they become known). If you find shows that I haven’t included, please let me know so I can add them for everyone to discover and enjoy. I sincerely hope you have as much fun answering the trivia questions, watching these shows and learning about lots of new and exciting stories as I did just from assembling this app. - Cellular data (3G/4G/LTE) charges may apply for viewing video over a cellular network. - Trivia Game is available in English, French, German, Spanish, and Dutch. Currently, Musicals History and Information is only available in English. Translations will come soon.